I’ve just received an AFSS reminder from the Council, what do I do? East Coast Fire & Safety technician are qualified to test all of these services and we can also issue the council with your Annual Fire Safety Statements of compliance. Where can I get a copy of my Test Record? Your current fire safety provider will be able to provide this to you. (Please note that this is your property and if you request it from your provider they must give it to you by law). If your site has not been previously tested, East Coast Fire & Safety will compile a full list of assets during the initial site visit. How long do my emergency and exit lights need to be tested for? To test emergency and exit lights the main power supply is turned off. The emergency and exit lights must remain illuminated for at least ninety (90) minutes, using only battery charge, for the lights to be compliant. How often should my fire equipment be tested? Fire extinguishers need to be tested by a competent practitioner every 6m and certified annually. Will any of the testing on site affect our ability to trade? If your emergency lighting system hasn’t been correctly installed it may be mixed with general lighting or power. Our electricians will confirm this with you during the initial visit and if this is the case we can arrange before hour bookings. If this is the case, East Coast Fire & Safety electricians can provide a quote to correct the system. 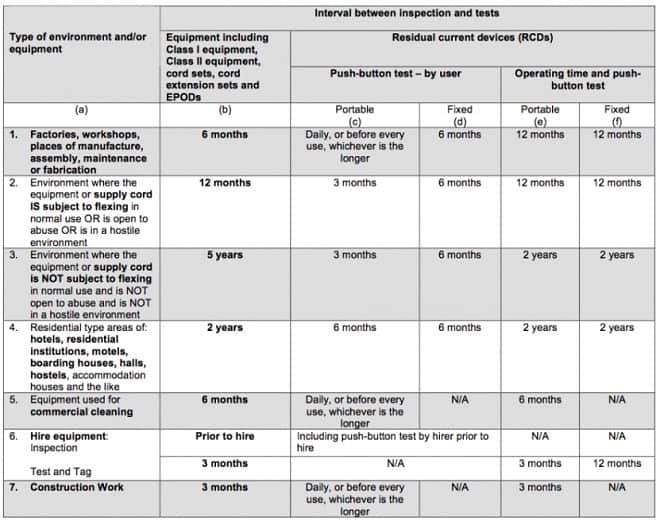 How often should my electrical equipment get tested and tagged? This will depend on the type of electrical equipment. Please see the table below or contact East Coast Fire & Safety for advice.